The GAD-6 monoclonal antibody ab26113 recognizes only GAD65 and has no cross reactivity with GAD67 on western blots of mouse brain or purified recombinant GAD67 and GAD65. ab26113 recognizes GAD65 primarily in nerve terminals in immunohistochemical analysis of brain sections (Kaufman et al, 1991). Our Abpromise guarantee covers the use of ab26113 in the following tested applications. WB 1/1000 - 1/20000. Detects a band of approximately 65 kDa (predicted molecular weight: 65 kDa). Phosphorylated; which does not affect kinetic parameters or subcellular location. Palmitoylated; which is required for presynaptic clustering. Cytoplasm > cytosol. Cytoplasmic vesicle. Cell junction > synapse > presynaptic cell membrane. Golgi apparatus membrane. Associated to cytoplasmic vesicles. In neurons, cytosolic leaflet of Golgi membranes and presynaptic clusters. Mouse monoclonal [GAD-6] to GAD65 staining GAD65-containing nerve terminals around cell bodies of Purkinje cells in the rat cerebellar cortex. Immunohistochemical analysis of frozen section from Mouse embryo, staining the glomerular layer of the brain. GAD65 is labelled with ab26113 (green) diluted 1:1000. Trb2 is labelled with ab23345 (red). Immunohistochemistry (PFA perfusion fixed frozen sections) - Anti-GAD65 antibody [GAD-6] (ab26113)This image is courtesy of an Abreview submitted by Patrick Ye. Immunohistochemical analysis of Mouse brain cortex sections, labelling GAD65 with ab26113, diluted 1/100. Thank you for the clarification! Unfortunately the blocking peptide is not available for this particular antibody. Please let me know if I can be of further assistance. may give mpre chance for my cells. If you can send me another GAD 65 ab 75750, I can try! I am sorry to hear that the replacement ab112497 did not work in Western blot. Just to confirm, there were multiple bands in your neuron lysate, and no bands with the rab brain lysate? Were you using the same protocol as before? I'm sending a replacement vial of ab75750 on the order ***, which we expect to arrive around Thursday of next week. Please keep me updated about the results with this antibody as well. If you have any questions or need anything else, please let me know and I'll be happy to help. I didn&apos;t try it in other Rat tissues, I may try it and let you know the results. I also couldn&apos;t find any related papers. I would like to try polycolone Ab. I'm sending a free of charge vial of ab112497 on the order **** so that you can compare the results to those with ab26113. This antibody is out of stock but we expect it to arrive around September 27 (next Thursday). For our records, could you also let me know if you block with milk or BSA during your Western blot experiments? Please keep me updated about the results with ab112497 once you've had a chance to try it. I look forward to hearing from you. If there is anything else that we can do for you please let me know and I'll be happy to help. Band around 65 kDa with rat brain tissue lysate, 40 kDa in neural cell lysate. Is this 40 kDa band specific. 1:1000 dilution. Normal culture conditions. Thank you very much for your call yesterday and for your patience while I've looked into your enquiry. I actually could not find a reference showing analysis of endogneous GAD65 in culture neurons by Western blot. So, I'm still not quite sure how to explain this 40 kDa band in your samples. Do you have access to any other tissues to use as a positive control, just to further verify that the antibody is binding specifically? Have you managed to find any information in the literature? I look forward to hearing from you. Please let me know if you have any questions or need anything else from me. I would have another question though: as the GAD65 antibody is confined to nerve terminals, is it (in general) possible to stain for GAD65 cell bodies? Are there antibodies that are specifically used to stain for these cell bodies? I mean in the literature you see stainings for GAD65 cell bodies..
We are happy to help customers find the most suitable products for their research purposes; however we are not specialized in this particular field and do not want to recommend a product that may be unsuitable. We encourage customers to consult the latest literature available through PubMed and other resources in order to find the most up-to-date information about their specific research interests. Thank you for your enquiry regarding ab26113. 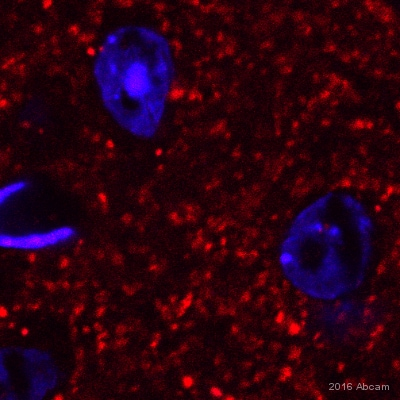 It has been reported that GAD65 is transported to nerve terminals and this antibody (ab26113) should stain them as “puncta” around the cell body of their target neurons. On the other hand, GAD67 (ab26116) is localized to cell bodies, axons and terminals and it will stain these well as long as the samples undergo antigen retrieval. 1 - Increase the concentration of primary antibody used to 1/200. 2 - Increase the incubation time to 3 hours at room temperature. I understand that the customer had previously purchased vials of this antibody and it has proved to be successful for them but as we have not tested ab26113 in either human cells or if it is not covered under our Abpromise. Please let me know if changing the above does not prove to be successful and I will if there is anything else I can do.